noodles, noodles & more noodles - that's what our pantry looks like after styling a noodle story for Fine Cooking magazine a few weeks ago. can't wait to show you the spread that i had so much fun shooting with this very talented and sweet photographer. rice noodles immediately make me think pad thai and while this dish is peanuty with chunks of tender chicken and the crunchy coolness of bean sprouts, i wouldn't exactly call it pad thai in the traditional sense. let's say it's more like a noodles in peanut sauce dish that you can adapt to whatever kind of noodles (rice, soba, fresh), protein and vegetables you have in the refrigerator. plus it was the perfect meal to eat out of a new gorgeous grey dish we bought from this amazing designer. in a food processor, combine vinegar, garlic, ginger, peanut butter, honey, soy sauce, chili garlic sauce and sesame oil and puree until smooth. set aside. cook noodles according to directions on package, drain and set aside. heat olive oil in a medium saute pan and cook onion, bell pepper and carrots for 4 minutes, or until translucent. add bean sprouts, chicken and peanut sauce and stir to coat. 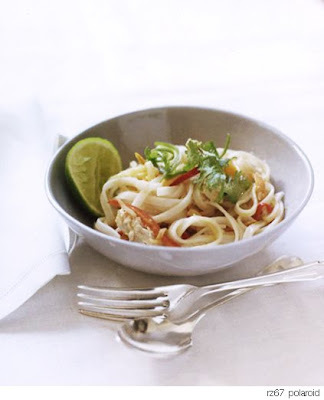 toss with cooked noodles and serve immediately with optional garnish. thankyou! just the inspiration i needed for dinner tonight. nothing i like more than a little peanuty-noodley-limey-goodness! Styling a shoot for Fine Cooking! Hmmm, I think you might be living my dream life....and these noodles look dreamy, too. Pad thai is the best, and so hard to find in restuarants (nice versions, that is). Yum! This is delicious! I love me some peanut sauce, and this is just awesome!